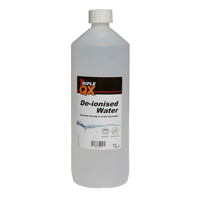 If you need to clean parts of the electrical system in your car, such as the battery, take a look at the de-ionised water we have below - available in a range of sizes and prices. De-ionised water is a great solution to have when you need to work on the electrical components of your car. As you may have guessed, this water has had the majority of its mineral ions removed, which means it can be used on electrical parts. This special type of water helps to prevent problems such as furring and limescale build up from occurring, which in turn means the connections in your system remain clean and clear, and enjoy a longer lifespan. 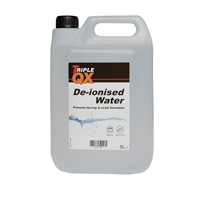 Above you’ll find de-ionised water from trusted brands such as Triple QX, and a range of sizes and prices too, so you can stock up on as much or as little as you need. We also offer a free UK delivery service, and a free click and collect service, and with over 130,000 parts to browse and choose from, it’s never been simpler to order and enjoy your new car parts, tools and accessories. Browse the range above, and don’t hesitate to get in touch if you have any questions.